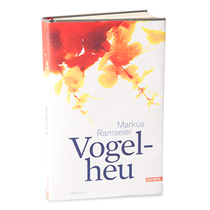 Markus Ramseier raises some important questions in the course of this admirably poised and subtle novel, asking about the sort of places that really matter to people: a palatial spa hotel or a grandparent's humble home? Questions about environmental protection and the dilemma of how to balance the technological progress with traditional values are unobstrusively posed alongside his thoughtful portrayal of the oddities and fractures of everyday life. (..) The novel's outstanding achievement is its enchanting depiction of the tender relationship between grandfather and granddaughter.